…but they decided to take my “side of pineapple” suggestion. Thanks, GETE! Pancake Queen? I’ll Take It! Thanks, Good Enough to Eat! Well, I made it back to New York City last week, and couldn’t wait to eat/review my first NYC pancakes since January (remember my Ditch Plains review?)! 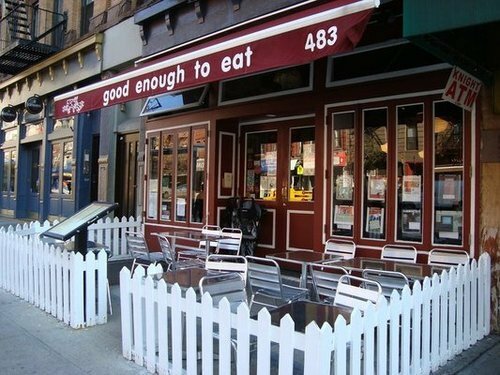 At the recommendation of a friend, we went to Upper West Side brunch spot Good Enough to Eat, located on 83rd Street and Amsterdam Avenue. This cute little gem in my NYC neighborhood made me wish it existed when I was growing up – and that was before I even tried the pancakes! I must say, I was pleasantly surprised to not only see multiple pancake-options, but to see a perfect combination of traditional and diverse pancake-options. While the waitress informed us the most popular pancakes on the menu are the Apple Pancakes, in honor of summer, I went with the Peter Paul Pancakes. Based on the perfectly melted chocolate chips, the crispy edges, and the fluffy inside, I knew these pancakes would be Good Enough to Eat before my very first bite. When pancakes are made with more than one ingredient, it’s easy to add too much or too little of such ingredients; however, the Peter Paul Pancakes were cooked to perfection. My only recommendation for this dish would be to perhaps add a slice of pineapple on the side, instead of a lemon, to complement the coconut sprinkling. 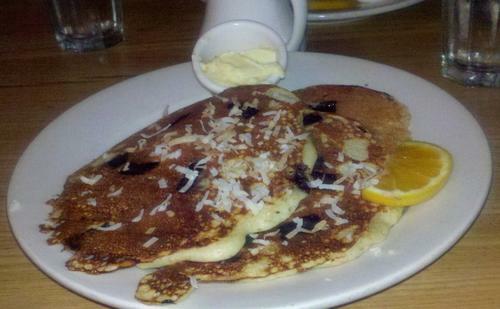 That being said, with all those chocolate chips, I needed a big glass of milk to accompany my breakfast – as I bet this is the case with most GETE patrons, perhaps the dish should be renamed Peter Paul and Dairy Pancakes! For Ma’amCakes’ first summertime review in New York City, this restaurant was a fantastic recommendation by my friend Julie. 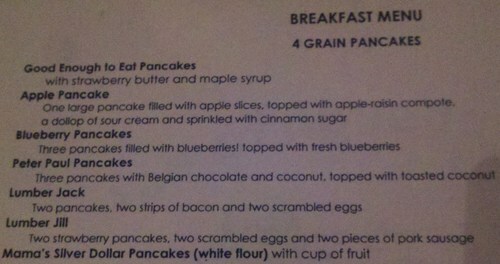 And the best part is that Good Enough to Eat serves breakfast every day! Overall, I’d say the Peter Paul Pancakes are definitely Good Enough to Eat! 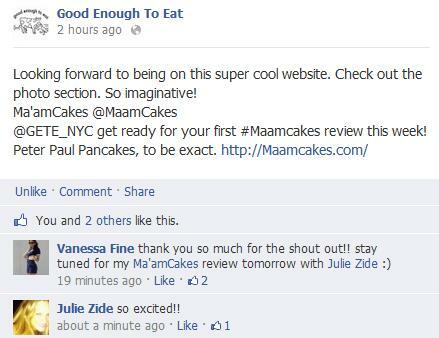 So Glad NYC Brunch Spot, Good Enough to Eat, is Anticipating My Review! Thanks for the shoutout, GETE!